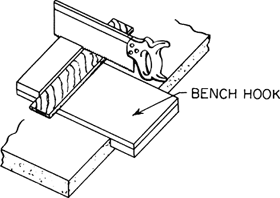 Any device used on a carpenter's bench to keep work from moving toward the rear of the bench. Also known as side hook. Any device used on a carpenter’s bench to keep work from moving toward the rear of the bench. Placing the 4 1/2" x 6" rubber image on the bench hook, students were reminded that areas removed by the tool would not print.